While real hourly wages (i.e., wages adjusted for inflation) grew across the board in 2015, this is largely due to a sharp dip in inflation; growth in nominal wages (i.e., wages unadjusted for inflation) has not accelerated. This dip in inflation is unlikely to be a durable source of future real wage gains. Nominal wage growth of 2.2 percent remains below a level where workers would reap the benefits of economic growth. There is no evidence of substantial acceleration of wages that would signal that the Federal Reserve Board should worry about incipient inflation and raise interest rates in an effort to slow the economy. Real hourly wage growth in 2015 was fastest at the top of the wage distribution, illustrating that wage inequality continued its 35-year rise last year. The gap between the middle and bottom has remained stable since 2000. The gap between the top and everyone else has grown. Looking at men and women separately, from 2014 to 2015, the strongest wage growth was at the top of the men’s wage distribution and at the bottom of the women’s wage distribution. For men, wages at the 95th and 90th percentiles grew by 9.9 percent and 6.2 percent, respectively, compared with only 2.6 percent at the median. While significant gender wage gaps remain across the wage distribution, there has been significant narrowing of the gap at the bottom and middle of the wage distribution since 2000. In 2015, faster low-wage wage growth occurred in states that increased their minimum wage. The 10th percentile women’s wage grew 5.2 percent in states with legislated minimum-wage increases, compared with only 3.1 percent growth in states without any minimum-wage increase. Racial and ethnic wage gaps are on the rise at the top of the wage distribution. Between 2014 and 2015, white wage growth was at least as fast as black wage growth at all deciles, and was far stronger at the top than at the middle or bottom. Wage growth at the bottom of the Hispanic wage distribution since 2000 greatly exceeded that of low-wage black workers, who actually experienced losses over that period. Regardless of race or ethnicity, within-group inequality has risen since 2000, with stronger growth at the top than at the bottom. Over 2000–2015, wage growth was faster among the more educated, but not fast enough to explain growing wage inequality. 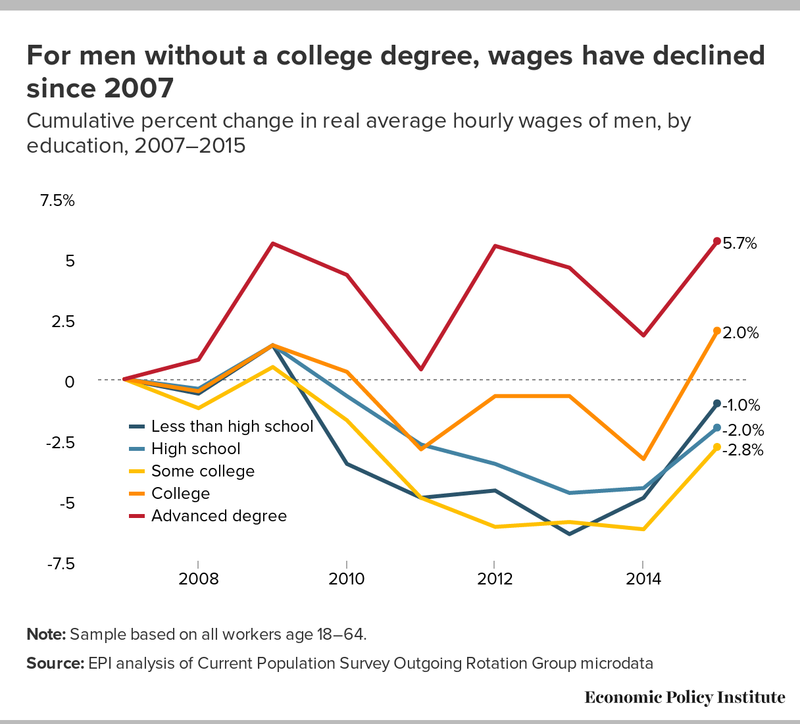 For both men and women, those with less than a college degree had lower wages in 2015 than in 2007. While there has been a slow narrowing of gender wage gaps for those with less than a college degree since 2000, gender wage gaps continued to grow among those with an advanced degree. Between 2014 and 2015, average hourly nominal wages for private-sector workers grew 2.2 percent (according to the Bureau of Labor Statistics Current Employment Statistics), in line with the 2.0–2.2 percent trend over the previous six years. At that slow rate, this crucial measure illustrates just how far the economy remains from a full recovery, let alone full employment. The weakened labor market of the last seven years has put enormous downward pressure on wages. Employers still don’t have to offer substantial wage increases to attract or retain the workers they want, even as the recovery has forged ahead in recent years. In the last few months, nominal wage growth appears to be picking up slightly, but remains significantly below levels consistent with the Federal Reserve’s 2.0 percent inflation target and likely trends in potential productivity (for more on this, see EPI’s Nominal Wage Tracker). Note: Changes were calculated from the latter end of each year (i.e., monthly data were calculated from December 2014 to December 2015; quarterly calculated from 2014Q4 to 2015Q4; semiannual calculated from second half 2014 to second half 2015). Taken together, these nominal wage growth and inflation trends mean that real (inflation-adjusted) average wages grew 2.1 percent between 2014 and 2015. From a historical perspective, this is a relatively healthy rate of real wage growth. For example, real hourly wage growth for the bottom 90 percent of workers averaged less than 0.5 percent annually since 1979 (Bivens et al. 2014). However, relying on low inflation to increase living standards is a poor long-term strategy for two major reasons. One, low inflation has been driven by large declines in commodity prices (particularly gas and oil), which are historically volatile and likely to stabilize or even rise in the next year. And, two, low permanent inflation would surely slow nominal wage growth (Bivens 2016). To see the role of commodity prices, compare overall inflation at 0.1 percent to core inflation (which removes more volatile energy and food prices) at 1.8 percent, shown in the sixth and seventh rows of Table 1. Using core inflation, most of the real wage gains disappear. To be clear, the gains to real living standards in 2015 were genuine—cheaper gas, oil, and other forms of energy all make paychecks stretch further. But gains that rely on near-zero inflation are not likely to be durable going forward. Figure A switches to the wage series (based on the Current Population Survey Outgoing Rotation Group, or CPS-ORG) that allows measurement of wage growth at different points in the wage distribution and by demographic characteristics. The green line shows that median hourly nominal wages for all workers age 18–64 grew 1.8 percent between 2014 and 2015. As with the Current Employment Statistics series discussed above, median hourly nominal wage growth has been relatively low and steady. Using overall inflation, real wages grew by 1.7 percent in the last year. But, using the more stable core inflation measure, real wage growth disappears. It is clear that the short-term gain in inflation-adjusted wages is driven by (likely) short-term drops in commodity prices that have a positive short-term effect on living standards, but are likely not sustainable. In fact, higher inflation is a better strategy for long-term growth in living standards for a number of reasons. For example, in an economy where households are still laden with debt, higher inflation helps erode the real burden of the debt more quickly, which also spurs recovery (Bivens 2016). The benefits of non-zero inflation are recognized by the Federal Reserve, which targets 2.0 percent price inflation. The Federal Reserve relies on nominal wage growth as its essential measure to determine whether there are pressures from accelerating wage growth that might push inflation above its target. So far, the data are clear on this question. While private-sector hourly wages saw a slight rise throughout 2015 (EPI 2016a), any signs of acceleration in real wages between 2014 and 2015 are driven by the sharp dip in inflation in 2015, and not by nominal wage acceleration. The wage and price data over the past year reinforce that the Fed acted too soon by raising rates in December, and that real wage gains in 2015 are not evidence of an economy that has achieved genuine full employment. Wage inequality has risen since the late 1970s—a trend that remained unchanged in 2015. The rise in wage inequality over the last three-and-a-half decades largely stems from intentional policy choices that have eroded ordinary workers’ leverage to secure higher pay (Bivens et al. 2014). These policy choices—made on behalf of those with the most economic power—include allowing the minimum wage to stagnate, eroding workers’ rights to bargain collectively, and prioritizing low inflation over low unemployment. Policies such as these have resulted in hourly pay for the vast majority of American workers stagnating despite growing economy-wide productivity, with economic gains highly concentrated at the top. The latest data from 2015 reveal the continuation of trends experienced through the Great Recession and much of the last three-and-a-half decades: slower growth for most and faster growth for those at the top. Table 2 includes data from 2000 (the previous business cycle peak), 2007 (the most recent business cycle peak), and the two most recent years of data (2014 and 2015). In the full business cycle from 2000 to 2007, growth was relatively slow overall and relatively unequal. 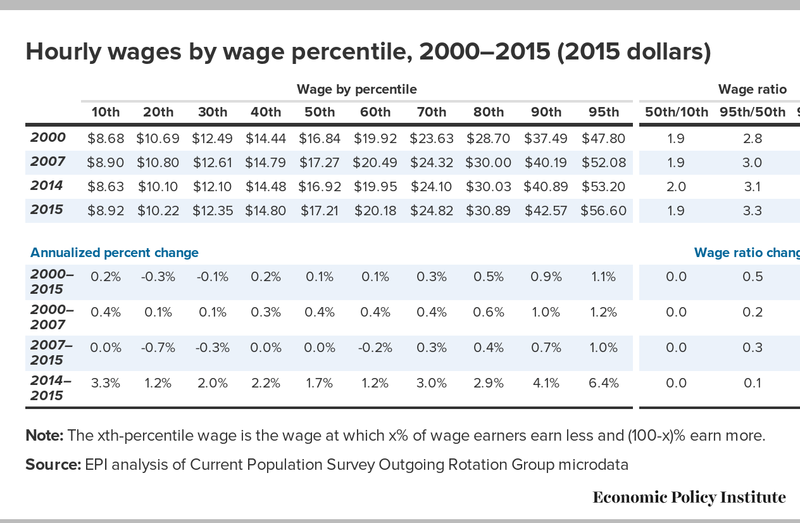 The gains at the 90th and 95th percentiles were higher than at the middle or bottom of the wage distribution. In fact, the middle and the bottom grew at practically the same rate over 2000–2007 as they did in the years since 2007. The ratio of wages at the 50th and 10th percentile of the wage distribution (i.e., the 50/10 wage gap, or the gap between the middle and the bottom) has remained fairly constant between 2000 and 2015, while the gaps between the 95th percentile and the 50th (the top and the middle), and the 95th and the 10th (the top and the bottom), have grown. Figure B illustrates the trends in wages for select deciles (and the 95th percentile), showing the cumulative change in real hourly wages between 2007 and 2015. Although the increases from 2014 to 2015 are primarily due to low inflation and not accelerating nominal wage growth (as previously discussed), the inequality story is clear. The lines clearly demonstrate that those with the highest wages have had the fastest wage growth in recent years. This trend continued quite clearly between 2014 and 2015. By 2015, the 95/10 ratio grew to 6.3 from 5.9 in 2007 and 5.5 in 2000. Similar trends are found in the 95/50 wage ratio, with those at the top pulling away. While the data discussed here clearly show a continuation of increasing wage inequality between 2014 and 2015, the CPS-ORG does not allow analysis of wage trends within the top 5 percent of the wage distribution. Using Social Security wage data through 2014, it can be shown that the top 1 percent grew 149.4 percent, while the bottom 90 percent grew only 16.7 percent since 1979 (Mishel and Kimball 2015). Note: Sample based on all workers age 18–64. The xth-percentile wage is the wage at which x% of wage earners earn less and (100-x)% earn more. Analyzing wages at different points in the wage distribution over time can mask different outcomes between men and women. 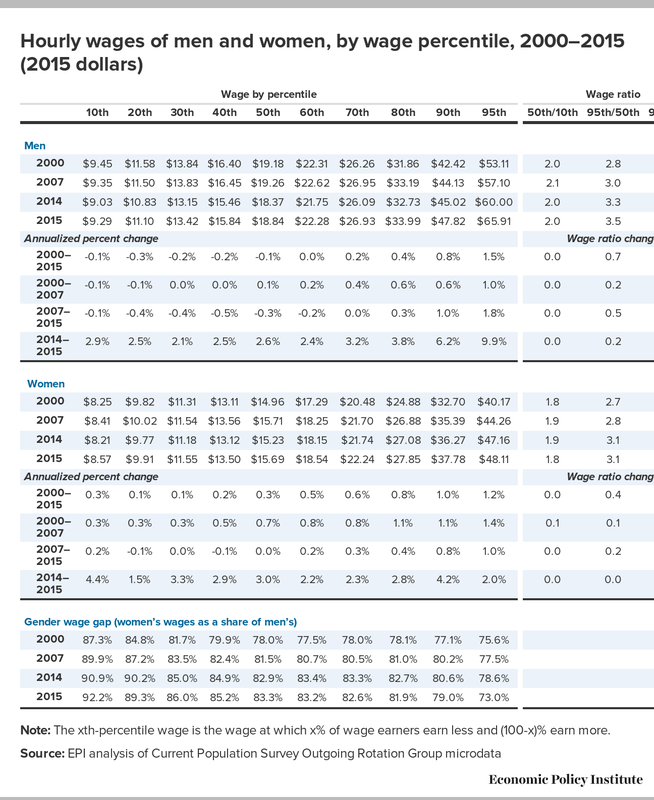 Table 3 replicates the analysis of wage deciles for men and women separately, with a comparison of gender wage disparities over 2000–2015. 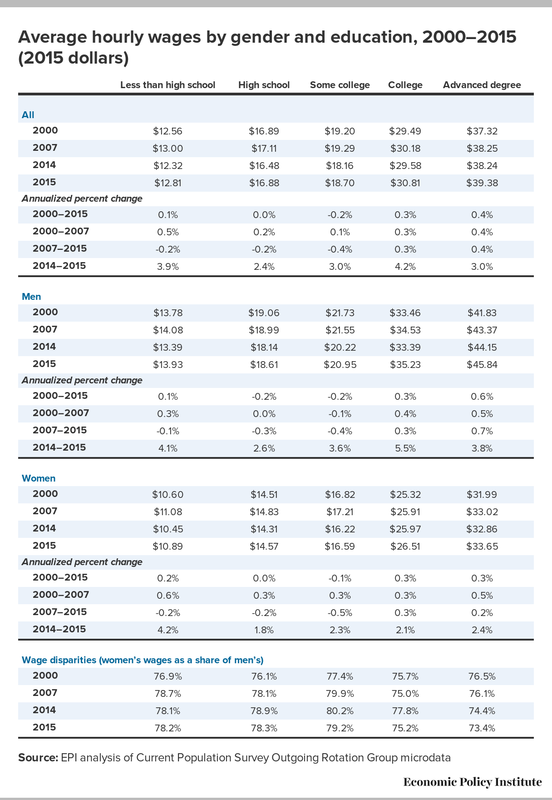 Figures C and D accompany this table, illustrating the cumulative percent change over 2007–2015 in real hourly wages of men and women at key wage percentiles. Long-term trends suggest that low- and middle-wage men have fared comparably poorly, and that wage gaps between the top and the middle (the 95/50 ratio) and the top and the bottom (the 95/10 ratio) have increased more for men than for women. 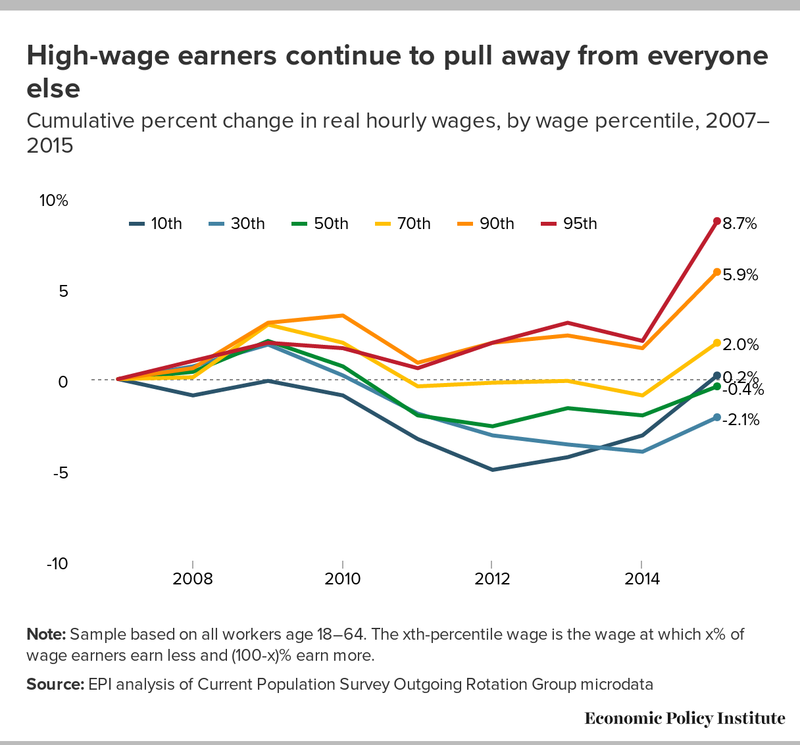 Figure C, which depicts men’s wage trends, shows the striking pulling away of the 95th and 90th percentiles since 2007, as the bottom 70 percent of male workers’ wages stagnated or fell. 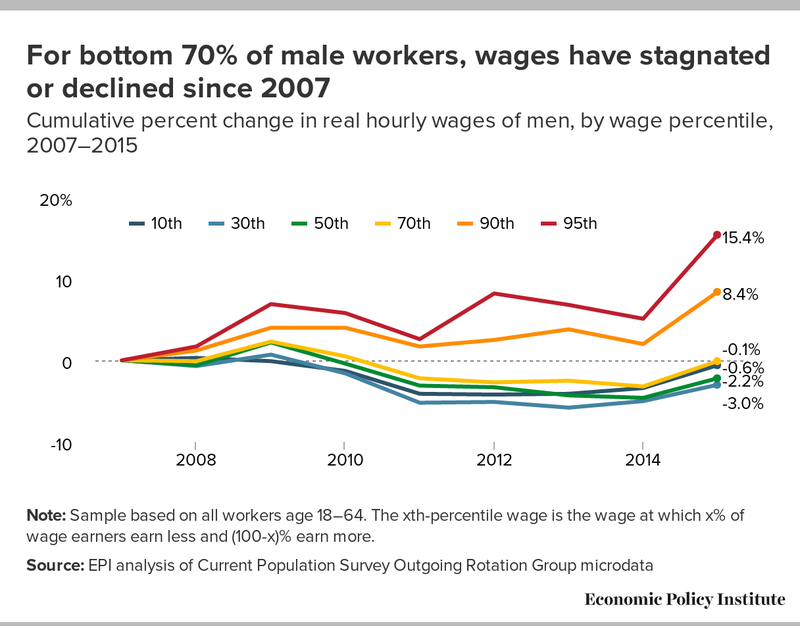 In fact, between 2000 and 2015, wages for the bottom 60 percent of male workers were flat or declined. In the last year, growth among men was far faster at the top, with wages at the 95th and 90th percentiles rising by 9.9 percent and 6.2 percent, respectively, compared with only 2.6 percent at the median. This indicates a continued concentration of wage gains at the top. In general, women’s wages are lower and less unequal than men’s. However, there appears to be some slow but consistent closing of the gender wage gap for all but the highest earners. Over 2000–2015, the gender wage gap at the median fell, with median women’s wages rising from 78.0 percent to 83.3 percent of median male wages. Unfortunately, a nontrivial reason for this narrowing has been falling men’s wages. In fact, 40 percent of the closing of the gender wage gap since 1979 has been because of falling men’s wages (Gould and Davis 2015). This is clearly not a desirable strategy for achieving gender wage parity or economic security for either men or women. The gender wage gap is greatest at the 95th percentile and has not been closing recently. Because of far lower wages at the top of the women’s distribution, the ratio between the highest and lowest wage earners is 5.6 for women, compared with 7.1 for men. As shown in Figure D, the spread of the women’s wage distribution has grown since 2007 (i.e., inequality has increased). Between 2014 and 2015, however, wage gains were more broadly shared. In fact, growth since 2014 was greatest among the lowest-wage women (though the 90th percentile was a close second). Upon further investigation, the significantly higher increase in the 10th percentile women’s wage, compared with most of the rest of the women’s wage distribution, is likely related to state-level increases in the minimum wage. 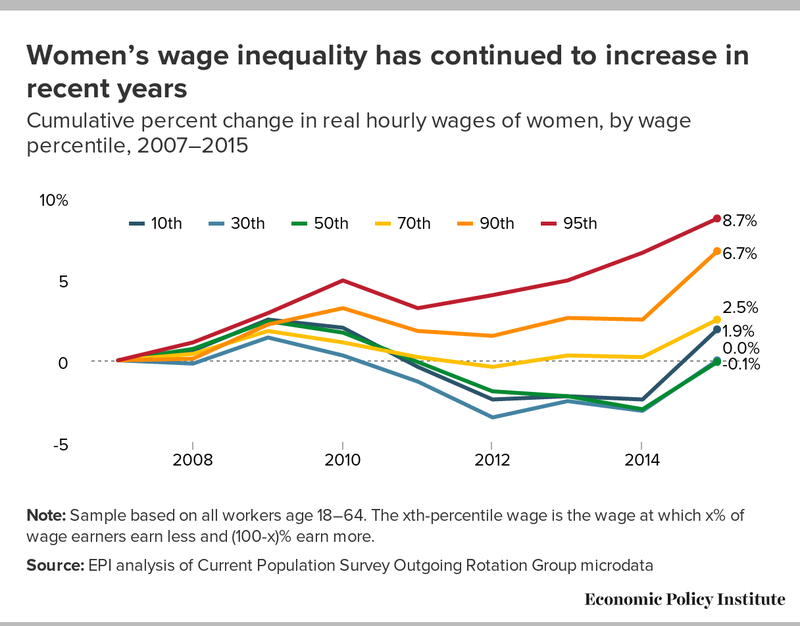 Women’s wages are lower than men’s at the bottom decile ($8.57 versus $9.29) and therefore may be more likely to be impacted by changes in the wage floor. Throughout 2015, though primarily at the start of the year, the minimum wage was increased in 23 states and the District of Columbia.1 Workers in states that increased their minimum wage in 2015 account for about 40 percent (39.8 percent) of the overall U.S. workforce. Figure E displays in green the states with legislated minimum-wage increases in 2015, while those in blue had automatic increases resulting from indexing the minimum wage to inflation. While the range of indexed increases ($0.12 to $1.25) is larger than legislated increases ($0.25 to $1.00), the average (unweighted) increases were in states with legislated increases ($0.77 versus $0.28). Note: Minimum-wage increases that occurred in New York and West Virginia on December 31, 2014, are counted as 2015 increases. A comparison of 10th percentile wage growth between states grouped by whether they had a minimum-wage increase and by the type of increase yields highly suggestive results. As shown in Figure F, when looking at 10th percentile wages by gender, growth in states without minimum-wage increases was slower than in states with any kind of minimum-wage increases. Among states with any minimum-wage increase, the growth in the 10th percentile wage was faster in states with legislated increases (which are, on average, higher than indexed increases). This holds true for both men and women at the 10th percentile. For example, the 10th percentile women’s wage grew 5.2 percent in states with legislated minimum-wage increases, compared with only 3.1 percent growth in states without any minimum-wage increase. This is a clear indication that strong labor standards can improve outcomes even when workers generally have severely reduced bargaining power. 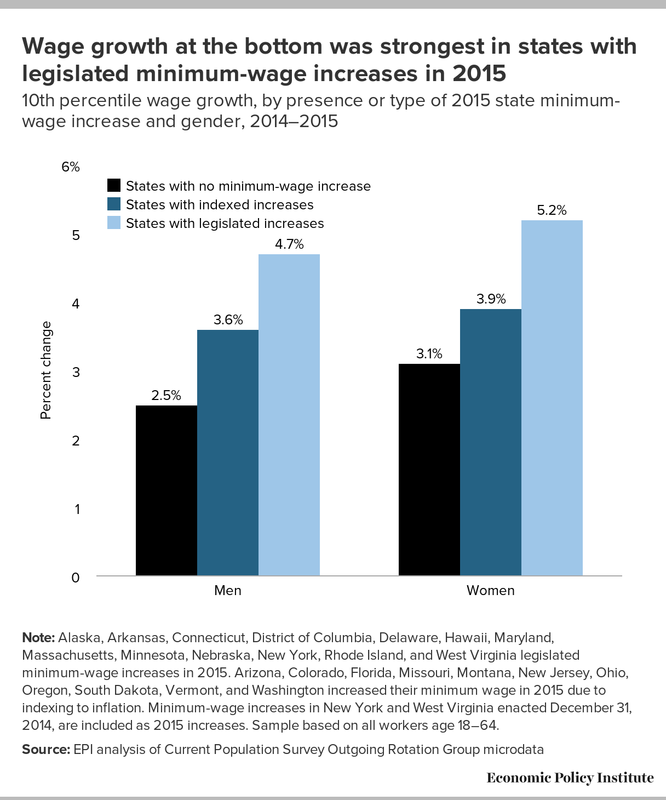 Note: Alaska, Arkansas, Connecticut, District of Columbia, Delaware, Hawaii, Maryland, Massachusetts, Minnesota, Nebraska, New York, Rhode Island, and West Virginia legislated minimum-wage increases in 2015. Arizona, Colorado, Florida, Missouri, Montana, New Jersey, Ohio, Oregon, South Dakota, Vermont, and Washington increased their minimum wage in 2015 due to indexing to inflation. 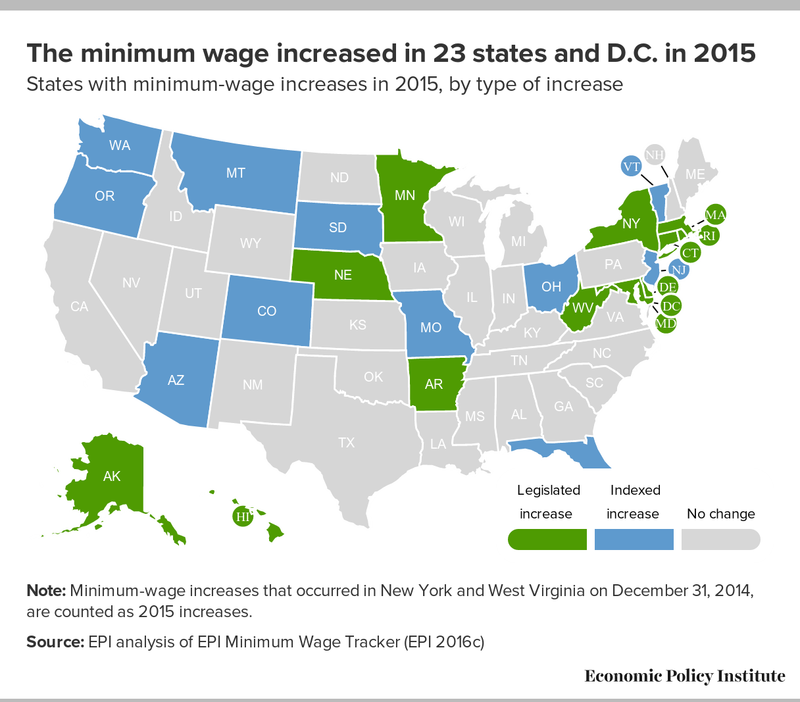 Minimum-wage increases in New York and West Virginia enacted December 31, 2014, are included as 2015 increases. Sample based on all workers age 18–64. Table 4 examines wage deciles (and the 95th percentile wage) for white non-Hispanic, black non-Hispanic, and Hispanic workers between 2000 and 2015. Between 2014 and 2015, white wage growth was at least as fast as black wage growth at all deciles, and was far stronger at the top than the middle or bottom. Median white wages are now at the same level they were eight years ago, and have only grown 0.3 percent annually since 2000. In 2015, wages for the bottom 60 percent of black workers are still lower than in 2000. Note: The xth-percentile wage is the wage at which x% of wage earners earn less and (100-x)% earn more. Race/ethnicity categories are mutually exclusive (i.e., white non-Hispanic, black non-Hispanic, and Hispanic any race). Between 2014 and 2015, Hispanic wage growth was more broadly based. In fact, Hispanic wage growth was faster in the bottom half than the top half of the Hispanic wage distribution. The faster wage growth at the 10th and 20th percentiles from 2000 to 2015 for Hispanic workers greatly exceeded that of similarly low-earning black workers, who actually experienced losses over that period. The differential was so great that the lowest-earning Hispanic workers now have higher wages than the lowest-earning black workers. The bottom half of Table 3 displays wage disparities, comparing black and Hispanic wages as a share of white wages at each decile of their respective wage distributions. Compared with white workers, black workers have been losing ground, with increasing racial wage gaps across the entire distribution. At the median in 2000, black wages were 79.4 percent of white wages. By 2015, they were only 74.8 percent of white wages. Conversely, Hispanic workers have been slowly closing the gap with white workers at the lower end of the wage distribution. Regardless of race or ethnicity, within-group inequality has risen since 2000, with stronger growth at the top than at the middle or bottom. Table 5 presents the most recent data on average hourly wages by education for all workers and by gender. Because of the significant drop in inflation, average hourly wages grew significantly across the board in 2015. The strongest growth was among those with a college degree, followed by those with less than a high school degree, at 4.2 and 3.9 percent, respectively. Wages for those with a high school diploma and no further education increased as well, but to a slightly lesser degree, at 2.4 percent. Because of this differential trend, the college wage premium—the regression-adjusted log-wage difference between the wages of college- and high-school-educated workers—grew, returning to its 2013 level. Even with this recovery in 2015, the college premium has increased only modestly over the last 15 years, whereas the growth in wage inequality between percentiles (i.e., the 95/50 wage gap) has been far greater (as shown in Table 2). A particularly prevalent story explains wage inequality as a simple consequence of growing employer demand for skills and education—often thought to be driven by advances in technology. According to this explanation, because there is a shortage of skilled or college-educated workers, the wage gap between workers with and without a college degree is widening. This is sometimes referred to as a “skill-biased technological change” explanation of wage inequality (since it is based on technology leading to the need for more skills). However, despite its great popularity and intuitive appeal, this story about recent wage trends being driven more and more by a race between education and technology does not fit the facts well, especially since the mid-1990s (Mishel, Shierholz, and Schmitt 2013). Even among college graduates, there has been a significant pulling away of the very top. The 50th percentile wage among those with a bachelor’s degree has fallen by 3.0 percent since 2000, while the 95th percentile wage of those with a bachelor’s degree rose 40.6 percent over the same period. The story is not one of a growing differential of wages between college and high school graduates, but increasingly one of growing wage inequality overall and within various education groups. Figures G and H display the cumulative percent change in real hourly wages by education for men and women, respectively. 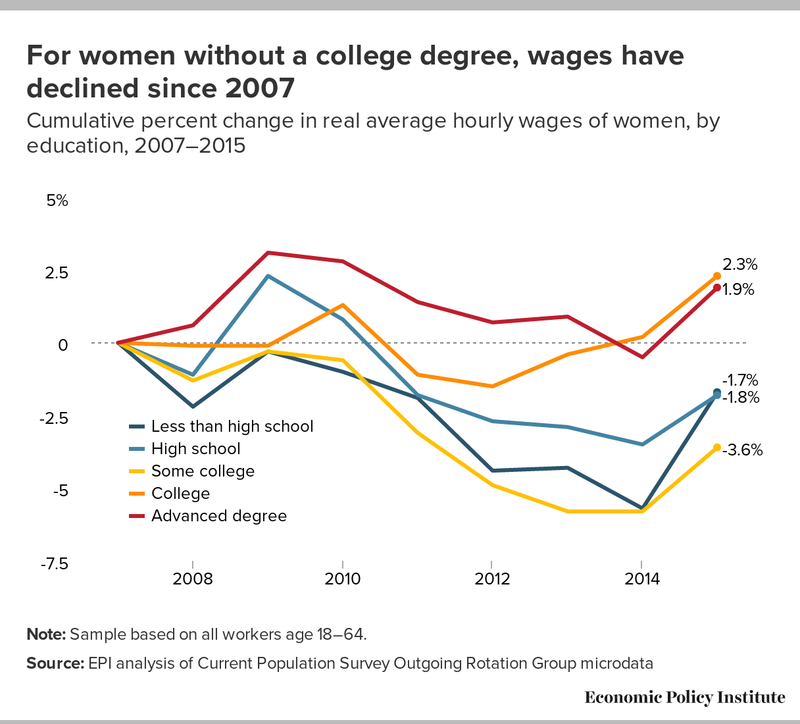 For both men and women, those with less than a college degree had lower wages in 2015 than in 2007 (the last business cycle peak). Between 2014 and 2015, across all education groups (except for those with less than a high school degree), wage growth was at least as strong among men as women, sometimes to a striking degree. Among the college educated, men’s wages grew more than twice as fast as women’s. While there has been a slow narrowing of gender wage gaps for those with less than a college degree between 2000 and 2015, gender wage gaps continued to grow among those with an advanced degree. 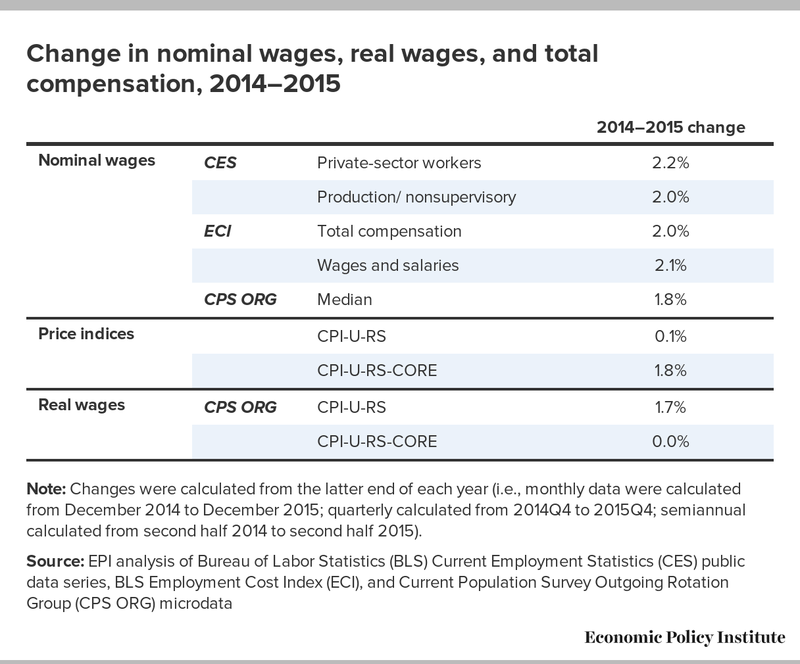 Overall, 2015 saw overall real wage gains driven by a dip in inflation. It also saw a pronounced increase in wage inequality. Larger gains in real wages were clearly concentrated at the top of wage distributions, with the exception of 10th percentile gains associated with state-level minimum-wage increases. Growth was faster for male workers and white workers, particularly at the top of the wage distribution, which continued to exacerbate racial, ethnic, and gender wage gaps. Wages for those with additional schooling remain higher than those with less, though the college premium has remained fairly stable over the last few years. 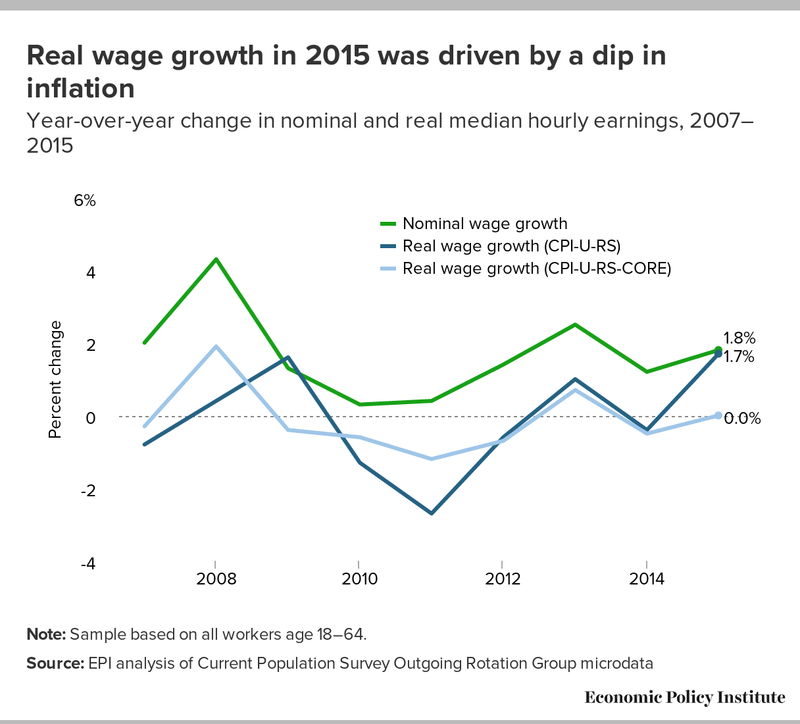 Real wage growth in 2015 was driven by falling commodity prices and not by accelerating nominal wage growth. This is important, as the Federal Reserve regularly analyzes wage trends in search of inflationary pressures. If the Federal Reserve makes decisions based on the data, it is clear that the United States is not in a period of inflation-spurring wage growth. And, for the vast majority of workers to experience stronger and more durable wage growth, the Federal Reserve needs to let the economy continue to recover. In lieu of stronger bargaining power elsewhere, full employment is one of the remaining levers that will allow most workers to see wage increases, as employers will have to pay more to attract and retain the workers they need. That lever is most important for workers at the bottom of the wage distribution (Gould, Davis, and Kimball 2015). To see strong broad-based wage growth outside of the tightest of labor markets, policymakers could strengthen labor standards, such as by raising the minimum wage, expanding eligibility for overtime pay, and protecting and strengthening workers’ right to bargain collectively for higher wages and benefits. For more policies that will raise wages, see EPI’s Agenda to Raise America’s Pay. The author thanks EPI research assistant Teresa Kroeger and EPI data programmer Jin Dai for their valuable contributions to this study. 1. Minimum wage increases that occurred in New York and West Virginia on December 31, 2014, are counted as 2015 minimum-wage increases. Bivens, Josh. 2016. “Should We Care About Slow Nominal Wage Growth When Price Inflation Is Slow? YES.” Working Economics (Economic Policy Institute blog), February 5. Bivens, Josh, Elise Gould, Lawrence Mishel, and Heidi Shierholz. 2014. Raising America’s Pay: Why It’s Our Central Economic Policy Challenge. Economic Policy Institute, Briefing Paper No. 378. Bureau of Labor Statistics (U.S. Department of Labor) National Compensation Survey. Various years. Employment Cost Index [database]. Current Population Survey public data series. Various years. Aggregate data from basic monthly CPS microdata are available from the Bureau of Labor Statistics through three pri­mary channels: as Historical ‘A’ Tables released with the BLS Employment Situation Summary, through the Labor Force Statistics Including the National Unemployment Rate database, and through series re­ports. Economic Policy Institute (EPI). 2016a. “Nominal Wage Tracker.” Economic Policy Institute website, accessed February 5. Economic Policy Institute (EPI). 2016b. “The Agenda to Raise America’s Pay.” Economic Policy Institute website, accessed February 24. Economic Policy Institute (EPI). 2016c. “Minimum Wage Tracker.” Economic Policy Institute website, accessed March 1. Gould, Elise, and Alyssa Davis. 2015. Closing the Pay Gap and Beyond: A Comprehensive Strategy for Improving Economic Security for Women and Families. Economic Policy Institute, Briefing Paper No. 412. Gould, Elise, Alyssa Davis, and Will Kimball. 2015. Broad-Based Wage Growth is a Key Tool in the Fight Against Poverty. Economic Policy Institute, Briefing Paper No. 339. Mishel, Lawrence, and Will Kimball. 2015. “Wages for Top Earners Soared in 2014: Fly Top 0.1 Percent, Fly.” Working Economics (Economic Policy Institute blog), November 3. Mishel, Lawrence, Heidi Shierholz, and John Schmitt. 2013. Don’t Blame the Robots: Assessing the Job Polarization Explanation of Growing Wage Inequality. Economic Policy Institute–Center for Economic and Policy Research Working Paper.